I know. That's a lot of yellow. My partner and I were on our way to the Lundy Canyon trailhead in the Eastern Sierra when we passed this campground road. We at first went past it and then wisely turned around. Never assume good light is going to last. I was trying to figure out how best to photograph this road surrounded by aspens when a motorcyclist pulled up. I happened to be laying flat in the middle of the road and he politely waited for me to get up before riding through. And then I snapped a series of photos; this one being the best because the motorcyclist is in that nice sunny patch in the middle. I had actually been shooting for a pic with the green pine tree smack in the middle of the tunnel created by the aspens. The thing with fall colors, I think, is that they need a counterweight, something that shows how unique and special the turning trees are. The pine tree and the blue sky help supply that. But the real reason the photo works is the motorcyclist. He makes it interesting. 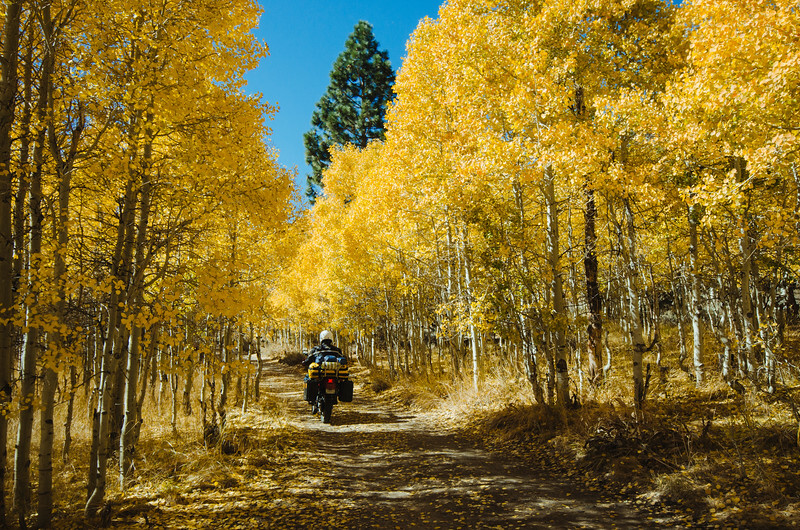 The photo may not literally tell you the guy was just riding through for kicks (he was) but it suggests it -- who doesn't want to walk or ride through a tunnel of golden aspens? Camera & Settings: Nikon D5100, Nikon DX 10-24mm wide angle lens at 19mm, ISO 160, f/11, shutter 1/250th. Shot handheld in RAW and processed in Lightroom 4 using VSCO presets. Wanna buy a print? Great! They're cheap and available in 8 x 12, 12 x 18 and 16 x 24. Click here for more details. I like the metallic prints, which really add some pop to the colors. Check out more of my work on my newly-redesigned SmugMug site. If you're interested in joining SmugMug, click here for a $5 discount on membership.